Since some amps and/or speakers tend to emphasize extremely high frequencies, the DeFizzerator can be used to roll off sizzly highs in the loops of Amptweaker pedals, inline with any pedals or buffers, in the effects loop of an amplifier, or even in a pedal switcher. One particularly good use is to help an amp sound like it's cranked when using it at 'bedroom' volumes. 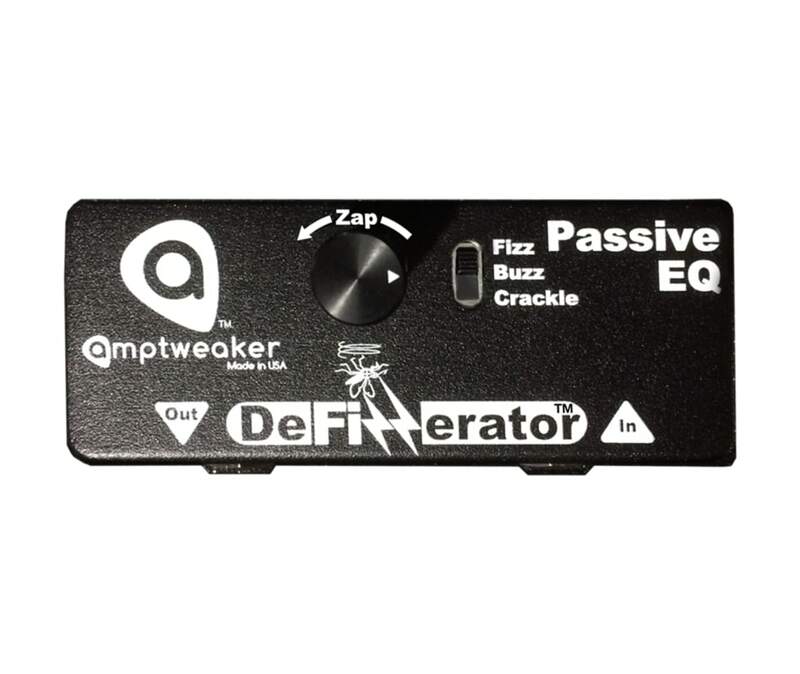 The DeFizzerator is a simple low-impedance passive EQ with 3 frequencies Fizz, Buzz, and Crackle are generally higher than a typical Tone or High EQ, so it's useful for really fine tuning the fizz. When using the DeFizzerator in an Amptweaker pedal loop, you will normally get better results by setting that loop to Post. This can also be used to add a high rolloff to the Boost loops of the Pro pedals, since sometimes cranking the gain up can give a bit more edge to the tone - normally that helps cut through, but if you want a more balanced tone, the DeFizzerator is a simple way to tweak your pedal yourself. The pedal is a low impedance design, so it doesn't add any noise, but of course cables shouldn't be long and wrapped near transformers or power supply lumps to avoid adding any ground loops. This is especially important if using it with an amp, since you shouldn't place it above the power transformer end of the amp(usually near the power switch and line cord). Since the DeFizzerator is passive, you simply patch it in and turn it down - also try setting it dramatically and then turn the pedal or amp's tone up more for different highend. Lower settings of the lower frequencies, Buzz and Crackle, might start to reduce the volume some, mostly due to the lack of highs, so you might have to make that up by turning up your pedal or amp's volume a bit - but this is a simple solution that requires no batteries, and you can just keep one in your gig bag to fix a scratchy backline!